Microsoft Word includes a powerful search function that includes many features. However, translators have some special interests which are not met by this function. MetaTexis, therefore, includes a supplementing search function. 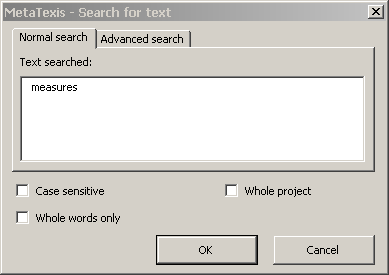 Unlike the internal Microsoft Word search function, the MetaTexis search function does not go to the next place where the text searched for was found, but presents you with a list of all TUs where the text was found. ▪ If text was selected in the active document when the command was executed, the selected text is inserted in the Text searched text box. ▪ If the cursor was placed in a word when this command was executed, this word is inserted in the Text searched text box. If the active document is a MetaTexis document that belongs to a project, the Whole project checkbox is shown. 2. Choose settings as appropriate (see Search Options below). 3. To execute the search, click the OK button. The search results will be displayed in the Show segments dialog box (see the Show Segments section below).